I am writing this from a state park forty miles outside of Portland where, for $40 a night, I have what can only be described as writerly bliss: a cabin of my own with very limited internet. Binge writing has a bad rap, but I am here to argue that we should still make space for the extended writing session. Binge writing is the unreasonable expectation that if we block out a large period of time, say, Saturday, we will get All the Writing Done. What usually happens is that we clean the house, pay bills, and then catch up on our Netflix series, finally sitting down to write at 10 pm only to discover that we are too tired to continue. Writing advice–givers, myself included, advocate the healthier practice of “snack writing”—short, frequent, low-pressure writing sessions. Snack writing means learning to write in the times most of us actually have available, which tend to be short stints between other engagements. But I am still a fan of the writing retreat. The change of location is important, but it can be a very slight change. I am a big fan of staking out friends’ houses for an afternoon or a weekend when they are out of town. I guarantee that your friends’ dishes and laundry will be less distracting than your own. I even have a camp chair with a sunshade that has played host to many an afternoon retreat. But my favorite retreats are the ones where I can get away for several days. Some retreats involve very little writing but include lots of time for “inviting the muse” in the form of walks, naps, or simply staring at the trees. Perhaps, too, I feel an attachment to the writing retreat because of its gendered history. Virginia Woolf identified the need for a “room of one’s own” because in the upper-middle class Victorian home, the gentleman of the house was possessed of a library which the lady of the house was expected to guard assiduously against the incursions of children, servants, and guests. He had, in other words, a man cave—a concept without an analog on the distaff side. Even though women were historically the guardians of the private, domestic sphere, it was men who had access to privacy for intellectual work within that sphere. Even during his two-year writing retreat at Walden, Thoreau apparently carted laundry home to his mother a few miles away. Women, in other words, have traditionally been laborers at writing retreats not their own. Even contemporary women, as sociologist Arlie Hochschild found, “do two-thirds of the daily jobs at home, like cooking and cleaning up—jobs that fix them into a rigid routine.” For women, particularly women in academe, it can feel like there is never physical or emotional time to focus on their own work. For this reason, just as twentieth-century feminists formed their own presses and workshops, they also founded retreat spaces specifically for women. 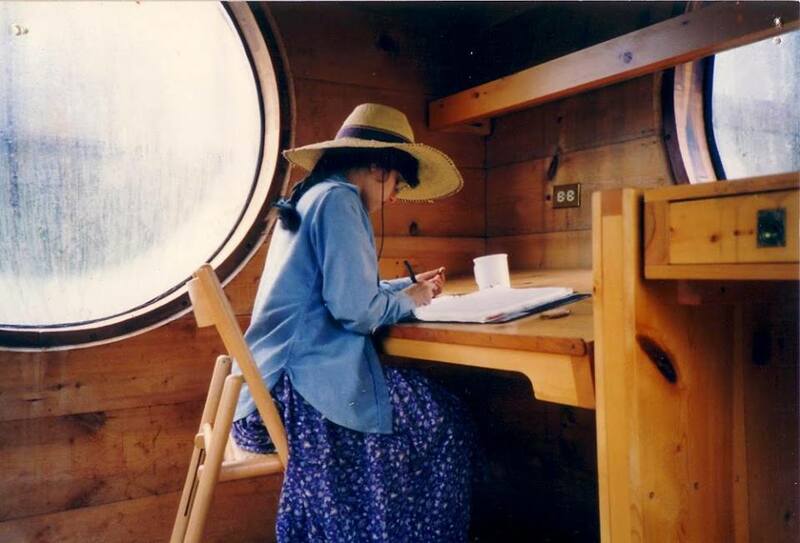 In the early 1990s I became a regular volunteer on a project that built a women’s writing retreat in the Oregon Coast Range. Founded and funded by a coalition of women writers and publishers, the Cabin at Soapstone Creek became a retreat center that housed two writers at a time. During the years when the cabin was in process, I joined monthly work parties where I learned how to shingle a building and buck timber with a hydraulic log splitter. I cleared trails, mowed weeds, and made lifelong friends. During those years I got to use the cabin and spent many happy weekends there writing and watching the swift-moving salmon-spawning creek. In the photo below I am happily ensconced in the cabin’s ship-like turret with four fish-eye windows overlooking the forest. Soapstone has long since closed its doors, but I still seek refuge in the abundant cottages, yurts, and campsites along the Oregon coast. Recently my neighbors offered me a few free nights at a casino hotel down the coast, and I became possibly the first person to finish an academic article and win at slots there. Wherever you are, I encourage you to find ways to emerge from the river of everyday life, to give your mind time to browse unexpected avenues, to write without pressure or expectation. Also treat yourself to the ScholarStudio Writing Resource Manual here. I really enjoyed your post! I like the idea of a writing retreat, especially ones where you connect with nature. Does one have to be in a group to have a retreat or can the retreat be a solo venture? I like to do retreats on my own, but everyone is different. Recently I took care of a friend’s house while she was on vacation and used her living room as a daytime retreat space. During the summer I rent cabins or camp sites as retreat spaces. Many official writing retreats require a residency of a two week or more, which is not doable for many people who are parents. I would look for informal, inexpensive ways to get out of the stream of daily life so you can make space for yourself and your work.